June 30, 2016, 5:00 a.m.
Last week’s referendum sparked confusion at Westminster and some panic in the money markets. Our latest research with Cebr also shows that it has unnerved consumers, too. 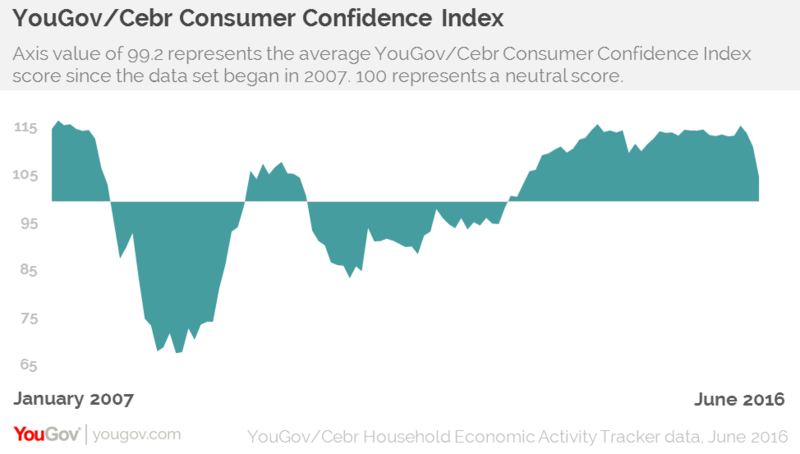 The YouGov/Cebr Consumer Confidence Index, which measures people’s economic sentiment on a daily basis, has collapsed since the vote to leave the EU. In the first three weeks of June it stood at 111.9 but in the days since the vote it has slumped to 104.3. Four days of uncertainty have wiped out the gains made over the last three years. The last time consumer confidence was at this level was in May 2013. While it has not yet plumbed the depths of the financial crisis in 2008, when it fell to a score of 67.4, it is only a week after the referendum and we fully expect it to decline further as the consequences of Brexit kick-in. 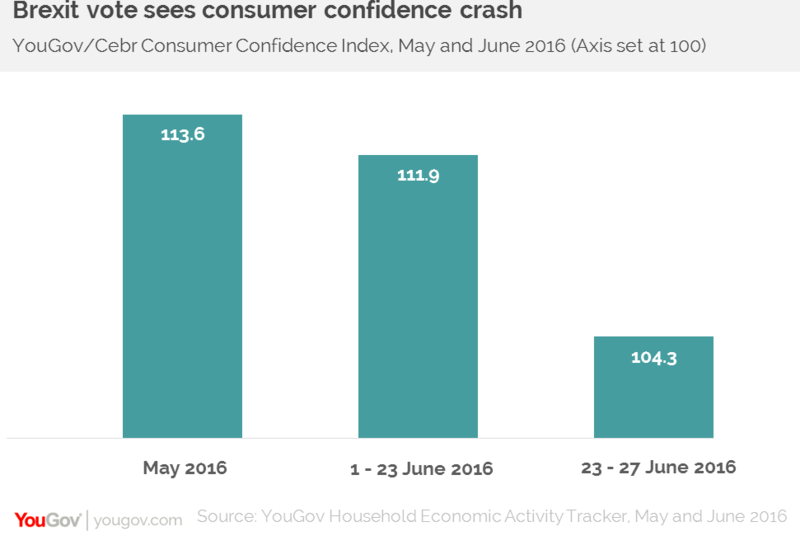 Furthermore, consumer confidence, which has been in a holding pattern over the past few months as the referendum approached, had already fallen notably between May and June as anxieties about the future crept in. The biggest causes for this were homeowners’ concerns about property prices over the next 12 months and the levels of business activity at people’s workplace over the coming year. It is clear that Brexit could lead to a marked slowdown in the economy over the coming months and recession certainly cannot be ruled out at this point. Our latest data show just how spooked households are by recent developments. In the coming months this is likely to filter through into a much weaker environment for retail sales and household spending – particularly on big ticket items. The main question now is whether consumer confidence will slump to the levels it reached eight years ago or will it pull itself out of this dive?